Not all collections that Just Collect has the opportunity to purchase come with a story. When they do, it is always in Just Collect's nature to share the joy that goes along with a nice lot of vintage cards. Just Collect was recently contacted by a local resident who "came across" some cards. After assessing the rarity of the cards and reaching an agreement on their actual market value based on condition, the local resident felt like Just Collect had earned that trust factor and revealed the true source of the cards. This particular seller is someone who purchases the contents from storage units and lockers at county/state auctions and sheriff sales. Most sports cards found in these places are the usual junk-era commons that dominate many collections. What you would hope to come across would be a nice assortment of vintage cards from the 1950s to '70s, which is exactly what this storage unit yielded. 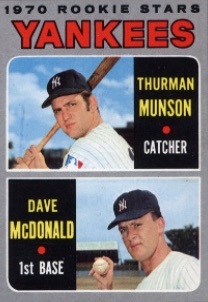 Not only were there multiple '67 Tom Seaver rookies, but also a Lew Alcindor (Kareem Abdul-Jabbar) rookie card along with a large amount of other 1969-70 Topps Basketball "Tall Boys," a partial set of 1970 Topps Baseball featuring a near-mint Thurman Munson rookie, and some 1964 cards, including Mickey Mantle, from the Hasbro game: Challenge the Yankees. 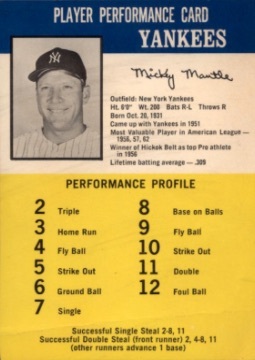 While the find did feature some good value, the remaining cards, however, were mostly low- to mid-grade examples from 1964 to 1968. This brings us to one of the main things collectors and buyers face when coming to terms on the value of their cards—the condition. When people looking to sell their new find or family collection want to determine the current market value, they usually end up on eBay looking for comparisons. The main mistake people make is thinking their cards are in much better condition than they actually are. This is common because people will always gravitate to the more expensive version of their card thinking they hit the jackpot. 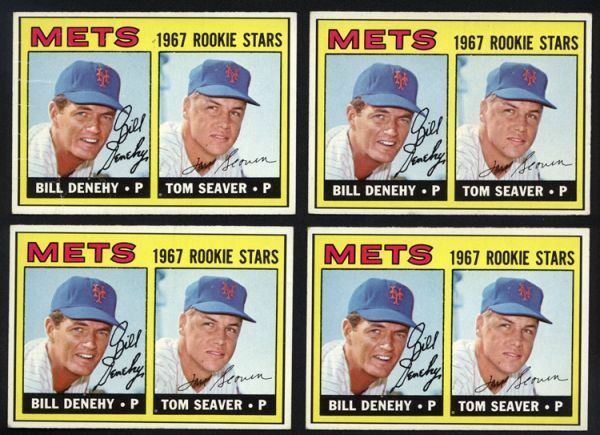 Using the below example of the four 1967 Topps Tom Seaver rookie cards, it is hard to tell the precise condition at first glance. However, upon close inspection by an expert like Just Collect, it was determined that the cards had small creases, putting their condition closer to VG with a value of about $300 each. This is a far cry from what a Near Mint-Mint Seaver rookie could bring in today's market. Thankfully, even though the owner of the cards insinuated his cards were higher-end examples, he was able to get the expert appraisal and friendly explanation from Just Collect so they could come to terms on a selling price. In fact, this seller was so impressed by the work Just Collect had done, he promised to call them first when he finds more sports items. Just Collect is always looking to purchase sports and entertainment cards from 1879 to 1979 and even some modern cards. If you have a collection that you are considering selling, or need an appraisal, contact them today for a current market estimate and a fair offer.